to entertain anyone who's ever felt frustrated trying to get into the holiday spirit. (802) 473-1801 between 10 AM and 6 PM. The December Playmakers is Monday, 12/8, at 7:30pm at the Off Center for the Dramatic Arts! New work will be shared by Mary Beth McNulty, Lesley Becker, & Jordan Gullikson, and a staged reading of Josh Martin's play will be presented by Mark Alan Gordon & John Jensen. Should be a great night! WILL is a partially fictionalized chronicle of Shakespeare’s experiences during the period in his life when he was about to write Hamlet. It is the eve of the Essex Rebellion, a plot to overthrow Queen Elizabeth, for which Shakespeare is accused of having had a part in inciting. Glascoe offers an unflinching exploration of the era’s political unrest and royal influence as well as the personal pain and artistic dreams of the man we have come to know as the greatest playwright of all time. The staged reading is being directed by Vermont Shakespeare Company Executive Director John Nagle and features the following actors in the cast: Kassandra Bell, Bruce Campbell, Garrett Kimberly, Jena Necrason, Robert Nuner, Molly Pietz Walsh, Scott Renzoni, Mark Roberts, Mary-Kate Scanlon, Paul Schnabel, Craig Wells, Ruth Wallman, and Eric Sheffer-Stevens as William Shakespeare. Eric was most recently seen as Edmund in King Lear with John Lithgow at The Delacorte Theatre in New York. MOXIE Productions presents a reading of Caridad Svich’s new play, Upon the Fragile Shore, exploring human rights and environmental issues, at 7 p.m. --free and open to the public. 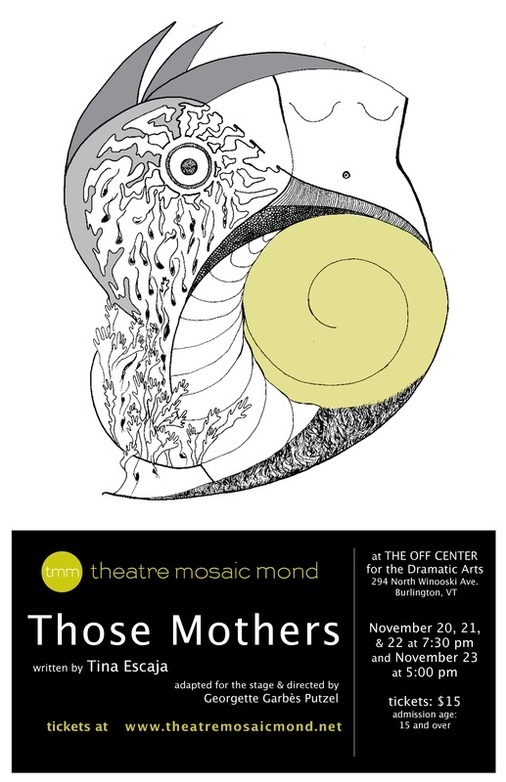 (Burlington, VT) MOXIE Productions joins the line-up of worldwide organizations that will present readings of 2012 OBIE Award-winning playwright Caridad Svich’s new play Upon the Fragile Shore. This work of intertwining monologues explores human rights and environmental issues around the world especially in relationship to human-made tragedies and their aftermath. These readings are an initiative of NoPassport (www.nopassport.org) for Human Rights International reading scheme. MOXIE Productions will present a reading of the play which centers on stories from the United States, Nigeria, Syria, Malaysia, sub-Sahara, and Venezuela. MOXIE Productions’ action will be produced and directed by Monica Callan with a cast of John D. Alexander, Haley Behn, Genevra MacPhail, and Sachiko Parker, on Monday, November 24 at 7pm @ The Off Center for the Dramatic Arts, 294 N. Winooski Avenue, Suite 116C, Burlington. The reading is free and open to the public, donations accepted. The overall reading scheme of the action is a coproduction between NoPassport theatre alliance (www.nopassport.org), Jody Christopherson, (The Skype Show, New York Theatre Review, http://newyorktheatrereview.blogspot.com/), and Missing Bolts Productions (www.missingbolts.com), and sponsored locally by Across Roads Center for the Arts (acrossroads.org). Contact moxie@pshift.com or 244-4168 for more information. The play is based on an earlier short play And so it is commissioned by New York Madness. Upon the Fragile Shore is a play with 16 characters, played by 4 actors, that focuses on human rights and environmental issues around the world especially in relationship to human-made tragedies and their aftermath. It is the third play in Caridad Svich’s trilogy of plays addressing national issues/global concerns, which include Upon the Fragile Shore, This Thing of Ours and The Orphan Sea (commissioned and to be produced by University of Missouri-Columbia, fall 2014). Svich’s other plays include: The Way of Water, Spark, 12 Ophelias, Iphigenia…a rave fable, and The House of the Spirits, based on the novel by Isabel Allende. 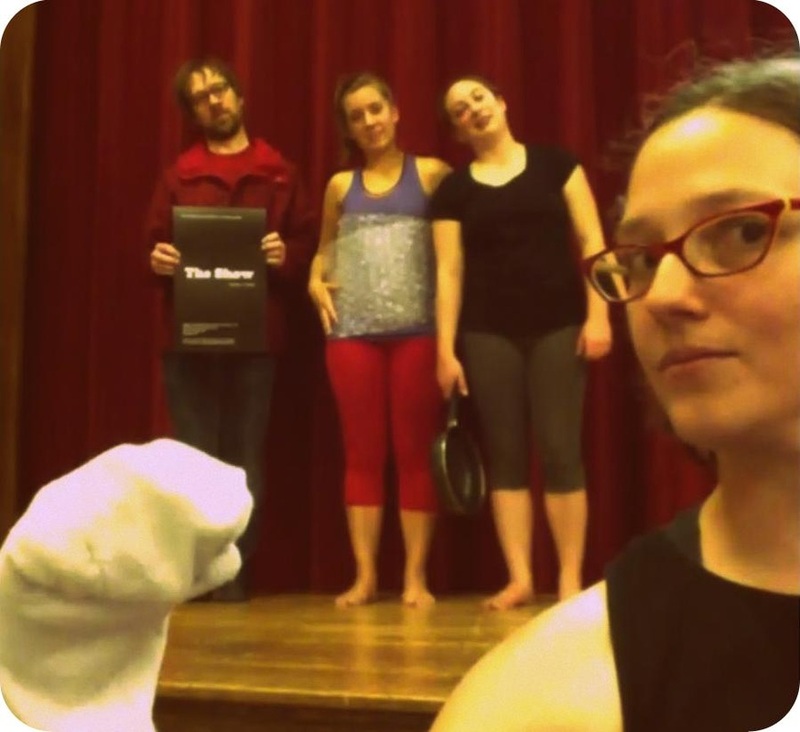 Her American Quartet of plays; Guapa, The Way of Water, Spark, and Hide Sky sustained global schemes in 2012, in which MOXIE Productions participated in both Waterbury and Burlington, VT venues. Spark premieres September 2014 at Theater Alliance in Washington D.C.
Additional theaters and venues that will be presenting the play include: Ensemble Theater of Norway, Ion Theatre (San Diego, CA). Road Theatre (Los Angeles, CA); Power Street Theatre (Philadelphia, PA); Theatre Simple (Seattle, WA); Teater Albatross (Stockholm, Sweden); Theater Emory (Atlanta, GA); Cara Mia Theatre (Dallas, TX); Great Plains Theatre Conference (Omaha, NE); Road Theatre (Los Anegels, CA), Teatro Diablo and ASU-Tempe (Tempe, AZ); Theater Alliance (Washington D.C.), National Institute of Dramatic Art (Sydney, Australia), Alameda Theatre (Toronto, CA), University of Pretoria (South Africa) Dept of Theatre, and Cornell University (NY), Baruch College (NYC), Missing Bolts (Digital Film Action, NYC), CalArts (California); Colectivo Teatral Nuevo Mexico in conjunction with National Hispanic Cultural Center’s Siembra: Latino Theatre Festival (Albuquerque, NM), Carthage College (Kenosha, WI); and alumni reading at New Dramatists (NYC). Additional presenting venues will be announced in the near future. Experimental staging. A non-linear account of tormented mother/daughter relationships. A drama with funny moments, pitting sexual repression of the second half of the twentieth century against the more liberal mores of the present day. A secret links the anguish of the mother and the daughter, ostensibly united in their still-evolving pursuit of sexual, reproductive, and intellectual liberation. Solo performer Dennis McSorley returns to Off Center with a new work- Typhoon of Tenderness. After his debut work, Who Made Me, premiered last year and received audience and critic acclaim, he now adds to his story. Typhoon﻿ traces a life from brightness and success to despair and darkness. Dennis will take you on a journey he knows all too well. Musician John Gagne adds a sound score to the work, adding his talent to the mood and emotions traced. Drawing from a wide array of experiences and styles, “The Show” is a quirky mélange of material – from the irreverent and humorous to the challenging and beautiful. Over the course of 14 dances (and perhaps a hidden bonus track), Dance Deliberation and Steel Cut Theatre present an evening of movement that will engage and entertain - an eccentric evening of movement performance featuring hand puppets and frying pans. 10/10-19 Look what's up next from Saints and Poets! The Saints & Poets Production Company (Peter Pan, Charlotte’s Web) presents a stage adaptation of A.A. Milne's famous tales of the "bear of very little brain." Rumors are flying among Pooh, Piglet, Rabbit, Owl and Eeyore as the mysterious Kanga moves to the forest with her son Roo. Their worst fears are realized when Piglet is taken into Kanga's household where he is bathed (with soap!) and fed spoonfuls of Strengthening Medicine. Pooh vows to save his friend...but will the bear's love of sweet honey foil his plans? Brought to life with a combination of live actors and puppets by the Burlington area’s acclaimed puppet theatre company, Winnie-the-Pooh is suitable for all ages. The second season of Playmakers will be kicking off Monday, Oct. 13, 7:30pm at the Off Center for the Dramatic Arts, with another SHORT SHORTS night! Everyone is welcome - and encouraged - to bring a play no more than five pages, and we'll cast and read it right there and then. Gonna be a fun night - hope you can make it! October Souls presents three short pieces every night. A gifted storyteller, he is now performing his own material and developing it for the stage. Feedback from prior performances was very positive. “ Found myself nodding ‘yes’ and grinning ear to ear.’ “Keeps popping back into my head.” “ So many opportunities to pause and reflect on big issues close to the heart.’ “ The rhythm and methophors hiy a home run.” – are just a few. In November 2013, the work was performed at the United Solo Festival in NYC- the biggest one person festival of it’s kind. ‘Who Made Me?’ looks at doubt, risk, confusion, faith and fear told by someone who has experienced all of these feelings and hopes to touch something in everyone by asking questions and not really answering them. Showtime is 7:30 pm. Ticket - $10- cash or check- small price to pay! In 3 Edge Ax – David Schein serves up three short slices to make a radical theater pie. Infarcation is a choral work with percussion, digesting “all the information” Schein absorbed on his return trip from a cardiac incident, including songs from the “first people.” Note from Earth writtten by acclaimed “noir” novelist Jim Nisbet, is a message to a girlfriend on another planet from a man on a charred and burning earth that is rocketing out of the solar system. 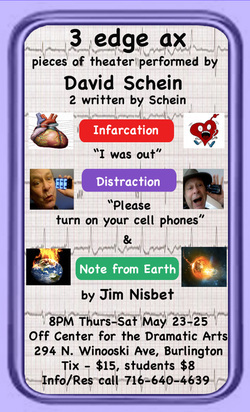 Distraction, written and improvised by Schein with the audience, is a new piece featuring Schein’s and the audience’s new best friend and scourge – their cell phones. Audiences are invited to leave their phones on and to answer and share all calls and messages during Distraction. 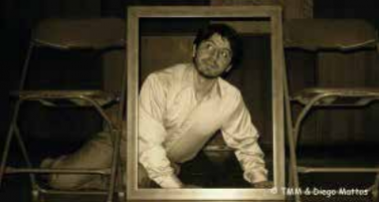 David Schein is the author of six solo shows, and many plays and musicals. His 70-person opera “TOKENS, a Play on the Plague” won three San Francisco Bay Area Drama Critics Awards and three Hollywood Dramalogue awards. He wrote for and toured with Whoopi Goldberg and worked in Tijuana creating radio for American Public Radio with “Border Brujo” Guillermo Gomez Peña. He has taught and performed theaters in France and Germany and is the co-founder of One Love AIDS/HIV Awareness Theater which performs shows about AIDS and gender equality in market places throughout Ethiopia. His article about founding that theater, “Incident in Awassa,” was featured in The American Theater Reader. He has been a guest teacher at Brown University, Naropa Institute, Middlebury College, Maison De Culture in Rennes, France and at the New England Young Writer’s Conference at Breadloaf. David is currently working on the film version of his solo “Out Comes Butch” with Constant Flow Productions in Köln, Germany, and collaborating with Vermont writer Geof Hewitt on a musical about global warming. He will be touring 3 Edge Ax to the West Coast in the fall of 2014. For more information about David go to davidschein.com. Jim Nisbet is a San Francisco writer is an acclaimed “noir” novelist who has published 13 novels, 10 which have been translated into French. His latest, Snitch World, has just been released. He has also written 5 books of poetry and his poems, essays and stories have been published in innumerable poetry magazines and anthologies. Nisbet won the Pangolin Papers Annual Fiction Award twice, and was thrice nominated by that magazine for a Pushcart Prize in short fiction. His novel Dark Companion was shorted-listed for the 2006 Hammett Prize, as well as Germany's Der Freitag Hotlist 2010, Best International Fiction. He has collaborated frequently with David Schein, producing three Actualist Conventions in the Bay Area and most recently reading from his work in a double bill with Schein’s “My Murder and Other Local News” at the Atelier de la Main D’or in Paris, France. 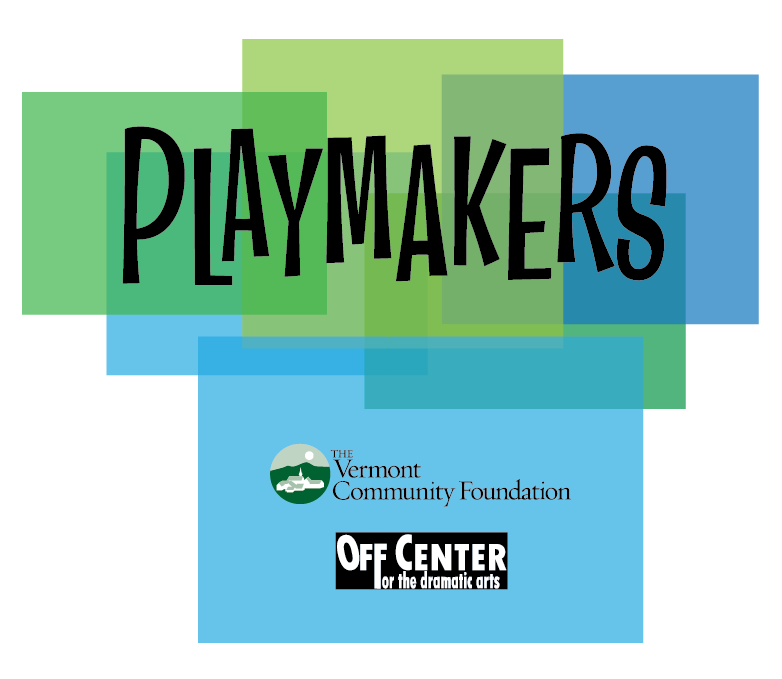 May's Playmakers is this Monday, 5/19, at 7:30 pm at the Off Center for the Dramatic Arts! There will be readings of works by Chris Caswell, Marianne DiMascio & Angie Albeck, and Seth Jarvis, as well as a directed reading of a piece by Dayton Shafer, presented by Syndi Zook and Bruce Campbell. Hope to see you there! Hope, despair, courage, fear, faith, joy, melancholy and uncertainty: being an immigrant. Asterion was a TMM world première in April 2013. Buy tickets at www.theatremosaicmond.net or at the door 30 minutes before the play. Asterion is a one act, one actor play composed, designed, choreographed and performed, with live music, by Diego Mattos, assisted by Georgette Garbès Putzel. Diego Mattos plays the charango on stage and some guitar will be played live by a Vermont musician. ...a unique and hilarious true story one-man play March 26th! A rosy cheeked Vermonter bumbles into a scary, notorious neighborHOOD… and buys a house! This one-man play Sold Out and received Standing Ovations in venues like the prestigious The Marsh in San Francisco! This is a uniquely funny true story where Michael Sommers plays all 30 characters from his father and grandfather to the Great-Grandmother with Parkinsons and her saintly if criminal son! This is the last area performance before returning to California. Don’t miss it! $10. (cash only at the door). Teens and above recommended. Children seem to enjoy the vigorous characters, but it is an adult show at heart. Tickets- $10. (cash only at the door). Michael Sommers (co-founder of Garage Theater, now named Green Candle Theater) returns after twenty years of acting and writing in California alongside such stars as Cate Blanchett, Eric Roberts, Robin Williams and Christopher Walken. Sold out The Marsh in San Francisco! America’s prestigious solo venue! Here’s what critics and audience members have to say about HICK in the ‘HOOD. “You will laugh all the way through… from the edge of your seat!” KWMR. “Two thumbs up, way up!” Tom Donald, film director. “Sommers is hands down the funniest, most unique character actor in San Francisco!” Velia Amarasingham playwright/producer. “A triumph! Hilarious, poignant, completely engaging!” John McConnell actor/musician. “The show helped me. It hit me hard because I realized that I am that kind of guy,” Andre Mathieu, actor. Teens and above recommended. Children have enjoyed the vigorous, funny characters, but it is an adult show at heart. 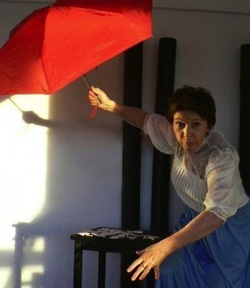 "It appears that I come out of the window of my tower at night, hanging from a red umbrella, with which I set the forest on fire"
Fugato Labile for Camille Claudel is a one act, one actress play composed, designed, choreographed, and performed by Georgette Garbès Putzel with a movement performer, a live musician and the assistance of Diego Mattos. Locked up in a mental ward against her will. In 2014 it happened to a woman in Vermont, whom a judge released days later. In 1913 it happened to a woman in France, who was never released and who died, cold and starved, after 40 years of incarceration. Born in a wealthy bourgeois family, Camille Claudel was a sister of famous playwright Paul Claudel. She studied under the famous sculptor Auguste Rodin and became his lover. Soon young Camille’s sculptures surpassed her famous teacher’s. She was joyful, truthful, dedicated to her art, indifferent to the games of high society - a free spirit. But she was born a century too early; society could not accept her lifestyle. Happy and creative in her youth, Camille died lonely and miserable. Why? Fugato Labile for Camille Claudel presents Camille in her own words: a true story of love, art and the challenges of being different. Music composed especially for Camille and performed live. The story follows Trudy, a lovable bag lady who befriends aliens from outer space in order to show them all humanity has to offer. 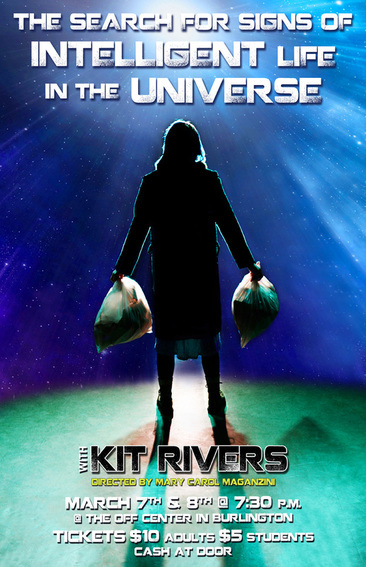 In this one woman play, starring Kit Rivers, we follow eleven characters on their journey to find their place in a world that is smaller than you think. Jane Wagner has written a hilariously poignant story about life, love and loss. Newsweek said “it is a dazzling, divinely human comedy!” It will be a show not to miss. Kit Rivers is a senior theatre major at Saint Michael’s College. She will be performing The Search to fulfill her Senior Honors Capstone graduation requirements. Kit has performed most of her life. Her favorite roles at St. Michael’s college include Romeo, in Romeo and Juliet, which was one of The Burlington Free Press’ Top 5 Shows of 2011, and Elizabeth in The Art of Dining. She has performed with Vermont Stage Company, Saints and Poets Productions, and the Saint Michael’s Playhouse. Awards include 3 Irene-Ryan nominations for the Kennedy Center American College Theatre Festival and a KCACTF recognition for excellence in directing. Kit Rivers is also a prominent stand-up comedian in the New England area. She has been a finalist for New England’s Funniest Comic competition, the Higher Ground comedy battle, and The Funniest Comic in Vermont competition. Tickets: Adults - $10, Students (with valid ID) $5. Tickets will not be pre-sold. We will require cash or check at the door. Our February Playmakers is Tonight! Monday, 2/10, at 7:30 pm at Off Center. presented by Emer Pond Feeney and Pamela Formica.